One day, a young boy is born. An extraordinary boy. A boy whose emotion influences the weather around him. When he is sad, it rains. When he is happy, sunshine prevails. Of course, like anyone with extraordinary powers, those around him begin to want. They want rain for their sunflowers, hot weather for the beach. Of course, this makes Weatherboy sad, so the town is frequently bathed in fog. Weatherboy runs away from home and lives in a tree house all alone. Because he is so cold and icy inside his heart, cold and ice prevail all around his tree house. It's not until meets a friend who loves ice and snow, that Weatherboy begins to feel like himself. His new friend wants nothing from him. They simply play and enjoy being happy and free. Weatherboy starts to warm up again. 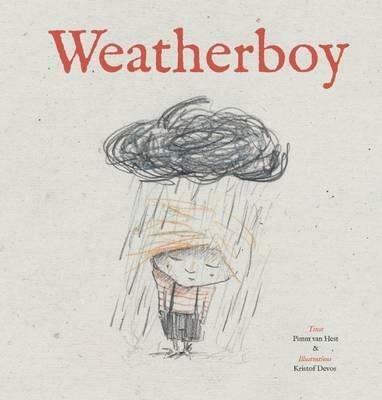 Here, I feel, is where this story should end, however, it continues and becomes quite cryptic--with Weatherboy simultaneously being too scared to become warm (and invite the sunshine in) and yet desperately wanting it at the same time. His relationship with his icy friend doesn't appear to help in this regard. The storyline is also confuddled by Weatherboy wanting to keep his friend the ice boy, and spending considerable time planning how he can do this, only to suddenly decide he needs to be warm again, and running outside on a rainbow, leaving his bewildered friend behind. Here endeth the story. While the bulk of this book has a lovely tone and coherent narrative, the discordant ending lets it down. Nonetheless, the over-arching themes of being oneself and letting the sunshine into our hearts is solid. The illustrations in this book are stunning ... folksy and beautifully evoking the mood of both boys and weather. A relatively high-text picture book, the formal yet well-written, fable-like narrative does allow this word count to work quite well. I recommend it for older kids, as the narrative would be lost on the very young. for your honest review and your substantive response.